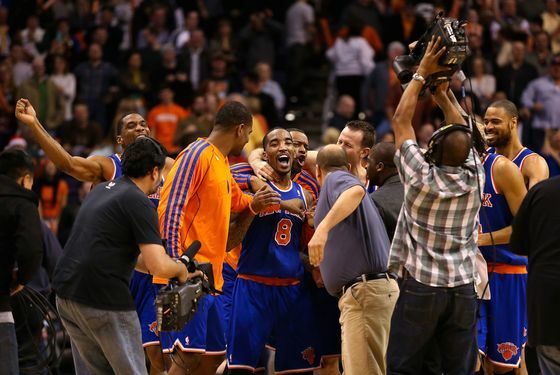 We're not sure we remember a more giddily entertaining Knicks player than J.R. Smith. How can it possibly be that the Knicks are only paying this guy $2.8 million? Even when he is doing one of those infuriating J.R. Smith things — and there have been fewer of them this season — you know it's out of effort, creativity, and flat insanity. He's impossible not to watch, and we haven't even started in on his Twitter feed yet. If you are looking for someone to take a highly contested, falling away, twisting, contorted, barely looking last-second shot in a tie game you probably deserved to lose but somehow found a way to hang in despite yourself ... J.R. Smith is your guy. Smith hit his second game-winning buzzer beater in a month last night to beat the Phoenix Suns 99–97, and before we do much of anything else, you need to watch it. All that's missing there is, right as Smith is letting the ball go, him being mauled by a tiger. The best part, though, might have been what Smith was doing on the bench before the shot, as captured by the Knicks Wall: Just staring at the ball, flipping it in his hands, ready to go. The Knicks needed all they could get from Smith — 27 points, five assists, six rebounds, and a whopping five steals, including some huge ones in the final minutes — because they were so shorthanded everywhere. Carmelo Anthony hyperextended his knee in the Christmas Day loss to the Lakers, and Raymond Felton, as it turns out, has a broken finger, which explains his shooting in recent days. (He's going to miss four to six weeks, which means the Knicks need a quick fill-in point guard. If only they'd had any recent luck just randomly grabbing point guards from the D-League and throwing them in out of desperation.) This left everything to Smith and Jason Kidd, the latter of whom might have even had a better game. The Knicks had blown a 14-point lead in the third quarter and trailed into the fourth until Kidd took over — driving, hitting open guys, draining five threes, and basically looking like the Kidd of ten years ago (only a better shooter). It's sort of unfathomable to imagine this team without him, and that's before Felton's injury. He and Smith nailed the last three possessions, too. Smith hit another crazy shot to tie the game with ten seconds left, but then the Suns, on their last possession, found Marcin Gortat open and streaking toward the basket. But Kidd, all wily vet, sneaked in and slapped the pass away, and Phoenix's Sebastian Telfair subsequently stepped on the end line. That allowed Kidd to hit Smith with a perfect pass to set up his crazy game-winner. It was not an inspiring game for the Knicks until the end, but that was inspiring enough. So the Knicks are now 21-8, despite, as has been pointed out by those smarter than us, lacking Carmelo for five games and four games without Kidd. And now they're going to be without Felton for quite a while. (Despite the way he's been playing, this isn't actually a good thing.) They finish up their short three-game Westward swing in Sacramento on Friday. Carmelo might not be there; Felton definitely won't be. Guess Smith and Kidd will just have to do everything themselves again. Fine with us!